Summer’s almost here! And your only goal is to have some fun. 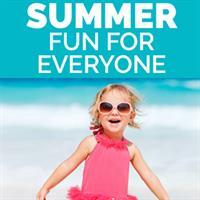 Summer fun should befor everyone! Choose from an activity-filled weekend getaway or a week-long retreat,complete with adults-only options and family-friendly hotels with waterparks and kids’clubs. Plus, enjoy exclusive rates, resort credits, and Kids Free deals at select resorts! Pristine, sugar-white beaches extend as far as the eye can see. Sparkling azure watersglisten, fragrant tropical gardens explode in dazzling color and picture perfect sunsetsignite the sky. Meander along the shores that once provided shelter to swashbucklingpirates. Listen to the soft sounds of the tree frog s as they mingle with the high notes ofa distant steel drum band. These are the islands of the Caribbean, where dreams ofparadise become a blissful reality. Take advantage of these savings, contact ustoday!Plus, mention that you are achamber member to receive an additional $25 off!